QUESTA, N.M. - Roger Herrera sits in his tidy living room, chain-smoking Pall Malls and telling the story of how a mining company changed his life and his hometown of 2,200 people. For nearly four decades, the Molycorp molybdenum mine has loomed over this mountain village near the confluence of the Rio Grande and the Red River. Its waste literally towers over Herrera's house; just a couple of hundred yards away, an earthen dam holds back 100 million tons of mine tailings. Herrera, 63, says he can't talk much about his relationship with Molycorp because of a 1980s settlement following a civil lawsuit against the mine. But what he can tell is startling. "I found out from the (state environment department) that a black calf will turn white from mine wastes," he says. "I didn't believe it, but I believe it now. Over here," he points toward the river, "their hair was falling off and they were drying up." Herrera doesn't talk about the effects the mine had on his family, which for years pumped drinking water from a well near here. He only asks, "So if livestock and wild game can get those metals and elements, what about people?" Village councilman Malaquias Raél fills in some of Herrera's story the next day. "His kids were getting white hair and white stripes on their nails when they were teenagers," says Raél. "That's supposed to be signs of metal contamination." A few miles up the Red River Canyon from the Herrera home in the Sangre de Cristo mountains, the mine that generated those metal-laden tailings sits amid the wreckage of 36 years of molybdenum mining: 328 million tons of waste rock, a 1,500-foot-deep open pit, collapse zones from underground tunneling, and gargantuan machinery and milling buildings. A nine-mile-long pipeline carries tailings slurry from the mill to lagoons, a pleasant name for lakes of acidic waste, located on the other side of Questa. A few Questenos commute to tourism-based jobs in Taos, or at the Red River Ski Area just up the valley. Fewer still scratch out a living as local shop keepers or small-time contractors, and a handful still work small farms or ranches. The mine is the boom-and-bust economic engine of Questa. Molycorp has at times been the largest single employer in impoverished Taos County, employing more than 600 at its peak. But employment has fluctuated wildly, the mine shutting down completely during two extreme slumps. All told, miners have pulled out of the ground approximately 100 million tons of molybdenum ore - a grayish metal used in high-strength, light-weight alloys found in mountain bikes and wheelchairs. Today, a skeleton crew of 150 people is busy developing a new ore body, running a load through the mill only every few months. Management still hopes to resume full-scale mining of some of the estimated 70 million tons of remaining ore, if the market ever rebounds. While molybdenum has been the lifeblood of Questa, disputes over the mine have also run toxic through the town's veins. For 30 years, citizens such as Roger Herrera have fought to force Molycorp to take responsibility for the damage it has caused the landscape and the health of the people who live here. For three decades, the company has stubbornly denied any adverse impacts. Attempts to negotiate with mine officials have fallen flat. In response, community and environmental activists have taken a hard line. And as the mining operation has atrophied, their opposition has grown stronger. They've sued the company and appealed its permits, gumming up the regulatory process at every opportunity. It has turned into a contest of bureaucratic filibustering from both sides. Now, with a federal Superfund listing looming over Molycorp, activists may have won the battle over Questa and the Red River. But the victory brings with it many new questions, and no one is sure whether this torn community can come together to chart a new course. Molybdenum has been mined in the Red River Canyon since 1921. It was a small operation until Molycorp, a wholly owned subsidiary of the multibillion-dollar Unocal (Union Oil of California) Corp., developed the open pit in 1964. Since then, the mine has become the single greatest influence on the lower Red River watershed and the community of Questa. Mining's presence is everywhere in Questa. Pieces of heavy machinery lie around yards and old slurry pipe has been recycled into fence posts and hay barn frames. On a high ridge of the Sangre de Cristos to the east, a stretch of waste rock spills over from the mine. To the west lies the 640-acre expanse of tailings lagoons. Molycorp has, at times, contributed well over $30 million a year to the local economy. With an average Taos County wage of less than $10,000 a year, families have come to rely on mine jobs paying $40,000 to $60,000. As one local put it, "The mine is everything, really, because it's given us everything. I think it'd be like a ghost town without the mine." This financial power has also given Molycorp significant political weight, which some say the company has used to push aside citizen concerns and environmental laws. "Molycorp set out to control the political machine, and that's how they've been able to get away with making a huge amount of profit by not taking care of their impacts," says Roberto Vigil, a fifth-generation Questeno woodworker and longtime community activist. As a result, he says, "Questa has been plagued with corporate abuse and official neglect." That the mine was careless was common knowledge in the community, even in the early years. Hundreds of spills from shoddy tailings pipelines poured into the Red River, and sometimes directly into acequias, local irrigation ditches. Then came the most glaring sign of industrial arrogance. In the early 1980s, the Red River began to turn a cloudy blue, a symptom of acid drainage and high metal content. Until then, the Red had been known as one of the best trout streams in the West. Suddenly, the fish were gone. The impact was so pronounced, says professional fishing guide Taylor Streit, that in his No-Nonsense Guide to Fly Fishing in New Mexico he divided the Rio Grande into different sections above and below the Red River, because he no longer found the big fish of the old days below the confluence. During those years, dust from the tailings had also been accumulating until, just west of town, blinding storms had become common. Analysis of the dust showed lead, zinc, cadmium, arsenic and mercury. Questa High School sat right next door. "I went with Little Joe to pick up his kids at the high school, and it was engulfed in dust. Kids were running around," says Vigil. "For the next couple of days, my own eyes and throat were burning. I thought about what we were putting these kids through." More than once, dust storms were so severe that the school shut down and sent students home. In 1980, the state championship baseball game at Questa High had to be canceled because of a dust storm. "Es una verguenza (It's an embarrassment)," village attorney Eliu Romero told the Taos News. While Molycorp is the largest hardrock mine in the Rio Grande watershed, an area of 180,000 square miles stretching from Colorado to the Gulf of Mexico, it took a long time for news of its activities to reach the outside world. In the 1970s, local residents formed Concerned Citizens of Questa to tackle Molycorp issues, ranging from unfair hiring practices to tailings spills, contaminated groundwater and toxic dust. In a story familiar to activists all over the West, the Questa group in the largely low-income Hispanic community lacked the money and technical and legal resources to take on a multibillion-dollar corporation. Local government officials, who were often mine employees, offered no help. State and federal agencies frequently looked the other way, allowing Molycorp to operate with lax regulation. With neighbors and relatives in this small town relying on mine paychecks, opposition was frowned upon as disloyal. That changed in the 1990s. Local activists reached out beyond the town to allies in environmental groups such as the Sierra Club, New Mexico Citizens for Clean Air and Water, Western Environmental Law Center, New Mexico Environmental Law Center and Amigos Bravos of Taos. The groups brought new resources to bear on the mine. Not surprisingly, mine supporters resented "outsiders' elbowing their way in, and even some mine opponents were angry about environmentalists taking over what was seen as a local issue. As local activist Joe Cisneros puts it, "We paved the way, we fought this tooth and nail, then Amigos Bravos came and took it." But the rift between local activists and Amigos Bravos has all but disappeared since the group, founded in 1988 around a Molycorp tailings issue, joined the cause. In 1995, Amigos Bravos filed its first lawsuit against the mine under the Clean Water Act, dogging every step of the regulatory process. Six years, two lawsuits and dozens of public hearings later, says the group's director, Brian Shields, "It's amazing how many resources you have to put together to fight something like this. It's hard for communities to do that." The lawsuits and growing public awareness have helped put Molycorp under the regulatory microscope. 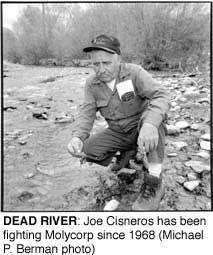 In 1994, the New Mexico Water Quality Control Commission reported that the mine "has rendered (the Red River) dead for at least eight miles." In 1996, a New Mexico Environment Department report documented pollution from the mine's waste rock. A 1998 EPA report again implicated the mine's waste rock as a significant source of river pollution. In 1999, the New Mexico Natural Resources Trustee, responsible for collecting compensation for natural-resource damage, released the most comprehensive report yet. It documented increased pollution of the Red River since the 1960s, when the open-pit operations began. 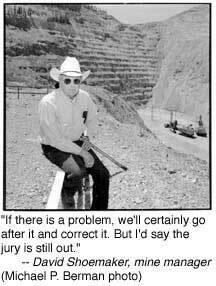 Later the same year, Molycorp landed on the Washington, D.C.-based Mineral Policy Center's list of the six most poorly regulated mines in the country, and Corporate Crime Reporter put the mine's parent company, Unocal, on its list of the "Top 100" corporate criminals of the 1990s. Things came to a head last winter, when Molycorp started preparing for a slew of regulatory permits that will all come due at the same time. By the end of 2001, the company must complete state groundwater permits, a state closeout and reclamation plan and two federal water permits governing discharges into the Red River. With state and environmental laws staring it in the face, the company will have to clean up its act, or so activists hope. The stakes are high for Molycorp. Molybdenum prices are rock bottom - $2.55 a pound, compared to $16 a pound only five years ago. Unocal now subsidizes Molycorp to the tune of $14 million a year, of which $2 million goes to environmental remediation in Questa. Yet these numbers pale in comparison to cleanup and reclamation that could cost up to $382 million, according to environmentalists - not to mention the potential of civil actions against the mine. Meanwhile, Molycorp representatives continue to deny responsibility for any pollution. A 1998 application to renew an Environmental Protection Agency permit claimed that "the Questa mine has not harmed, and may have improved, the condition of the Red River." That assertion is based on a Molycorp-commissioned study that concluded that there are more fish in the stretch of river directly below the mine than above it. The study blames natural erosional scars upstream for the elevated levels of aluminum, cadmium, copper, chromium, cobalt, iron, molybdenum, manganese, nickel, lead and zinc detected in the river. It also says that the mine's groundwater pumping intercepts any contamination before it gets to the river and runs it through the mill to the tailings. The same study says that, despite the fish stories of yore, the Red River was never a hardy trout stream. "Looking at the net impact over time, we feel we have information that we don't have any impact," says mine manager David Shoemaker. "If there is a problem, we'll certainly go after it and correct it," he adds, "but I'd say the jury's still out." Others agree with that assessment. "From the standpoint of an employee, I may be prejudiced in favor of the mine, but they have come up with very convincing arguments," says Carlos Cisneros, who is a state senator, secretary of the local union and a Molycorp welder. "Just from my layman's viewpoint, it's been polluted pretty much for the last 20 years, but is it caused by mining?" Molycorp officials add that they are busy planning to clean up the tailings piles and open pit. Under the 1993 New Mexico Mining Act, the company must complete a comprehensive reclamation plan by the end of 2001. That means it must return over 1,300 acres of open pit, waste rock and tailings to a "self-sustaining ecosystem" once the mine closes. The company's draft reclamation plan calls for covering the mine tailings near the mill with nine inches of soil and planting grasses directly in the waste rock everywhere else. The company has offered to put up a $60 million bond to insure the cleanup. Environmentalists and state agencies say that the company's plan falls far short. The state is calling for more stringent clean-up guidelines and a $130 million bond. Amigos Bravos, which has just released a reclamation plan of its own, says cleanup will cost $378 million. Their plan calls for covering the entire wasterock area with three-and-a-half feet of cap material and soil, as well as perpetual water treatment and other measures. 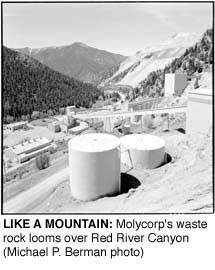 "Molycorp is not willing to do what 99 percent of other mines are doing," says Jim Kuipers, a Boulder, Mont.-based mining engineer who left the industry five years ago to work as a consultant for public-interest groups. Kuipers, who wrote Amigos Bravos' reclamation plan, says that Molycorp is behind the times. "Their reclamation proposal is like an Edsel without an engine," he says, "while some other companies are proposing Cadillacs." Overlooking the open pit from a high ridge, a genuinely perplexed Shoemaker says, "I don't know what everyone's so upset about." Pointing to seedling pines and cottonwoods planted directly into the waste rock, he explains, "We've spent a lot of money on "reveg" work - at least a million - and we believe this will lead to a self-sustaining ecosystem. We've got 25 years of "reveg" to base it on." Then he adds, "We're going to plant some bigger trees so people can see the damn things." In a state that has seen little of the nationwide economic boom, officials have done their best to work with Molycorp. Last winter, the state environment department spent six months negotiating with mine officials over a cleanup plan. In the end, Molycorp's legendary obstinacy held true. After several ultimatums and missed deadlines, says New Mexico Secretary of Environment Pete Maggiore, "We couldn't come up with anything. We had made some concessions to show we were willing to go the extra mile, but were frustrated to find that the ball had been moved. "Molycorp put themselves in this position," continues Maggiore. "I would suggest that it is not a matter of (the state being) pro-business or anti-business, but it's a matter of business being responsible and being good stewards." Even New Mexico's staunchly pro-business Gov. Gary Johnson finally lost his patience, and on April 1, he recommended federal Superfund designation for the mine. On May 11, the EPA followed with a draft Superfund listing in the federal register. A final decision is expected this fall. Shoemaker says Molycorp will appeal a Superfund listing. For if the mine lands on the list, the EPA will take over the clean-up process, completing the necessary studies and dictating what work needs to be done. EPA officials will then send Molycorp the bill. If the company goes bankrupt in the meantime, as the owner of the Summitville Mine in Colorado did in 1992, the taxpayers will be left with the tab. People on all sides of the issue agree that a Superfund-directed cleanup is cumbersome and weak in public participation. 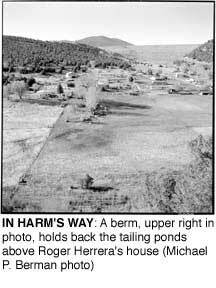 A look at Summitville shows that a Superfund cleanup can also be slow, frustrating and expensive (HCN, 6/19/00: Colorado considers a mining ban). Still, activists such as Amigos Bravos welcome the draft listing. "There are some (Superfund) sites that have worked, others that have become nightmares," says Amigos Bravos' Shields, "but I'm willing to try anything at this point." Locals ponder what Molycorp will look like under federal supervision. Steady and good-paying cleanup jobs could keep locals employed for at least as long as mining has, says David Douglas, who owns a cabin on the Red River next door to the mine. "Superfund could bring a new economic boom to Questa, well into the middle of the century," he says "The potential is there for Questa to reinvent itself as a showcase of environmental cleanup." Pete Maggiore is anxious to help with the transition. "EPA has opportunities for retraining displaced workers," he says. "If we could be of any help in that regard, we'd like to." Shutting down and cleaning up mines reinvigorates local economies, according to University of Montana economist Tom Power. He says these post-extractive economies attract a new rural type - telecommuters and other well-heeled residents who come for the amenities of open space, clean air and recreation - who breathe new life into the economy. Not everyone thinks that's the right direction for Questa. "Will we turn into another (touristy) Taos?" wonders Councilman Raél. "How do we preserve what we have here and have some economic development?" For better or worse, tourism remains the bread and butter of northern New Mexico. 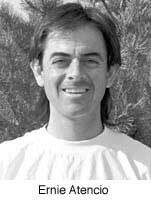 In the mid-'80s, Roberto Vigil and several others founded the Artesanos de Questa Cultural Center to encourage local artistic traditions and offer an economic alternative to the mine. Several small studios and antique shops have popped up in recent years, marketing local arts and crafts. Others in Questa would like to see a return to agriculture, once irrigation waters are again safe. An organic wheat cooperative up the road in Costilla, N.M., has been remarkably successful, and local organic produce is finding a larger market. Questions about Questa's future remain unanswered for now, but almost everyone except Molycorp concedes that the future is Superfund and there's no turning back. The mine may sputter along for a few more years, but will never again bring genuine prosperity to the area. It's up to the community to come together to develop a new economy that suits its unique history and character. "I think for the future of the next generation, like my grandchildren," offers Roger Herrera, "I want to see that they grow up in a clean, safe environment, instead of having their pockets filled with money with an unhealthy environment." Ernest Atencio lives down the road from Molycorp in Arroyo Hondo, N.M. He is former Projects Director for Amigos Bravos and a former HCN intern. Photographer Michael P. Berman lives in San Lorenzo, N.M. His recent work has taken him to the Cabeza Prieta National Wildlife Refuge in Southern Arizona. New Mexico Mining & Minerals Division, 2040 S. Pacheco, Santa Fe, NM 87505 (505/827-5988).